The holidays are fast approaching! Christmas is only a few weeks away. If you have a Guardians of the Galaxy fan in your home, you need to have a plan. And you’re gonna have to have more than 12% of a plan. 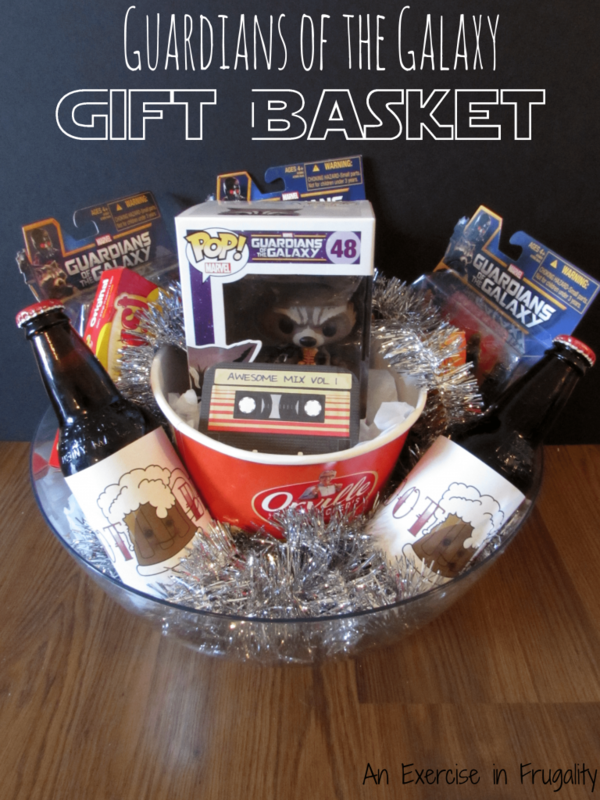 If you’re still looking for a great holiday gift idea, check out this adorable Guardians of the Galaxy gift basket. You can put it together in just a few minutes, and it makes a GREAT gift for anyone who enjoyed the movie. 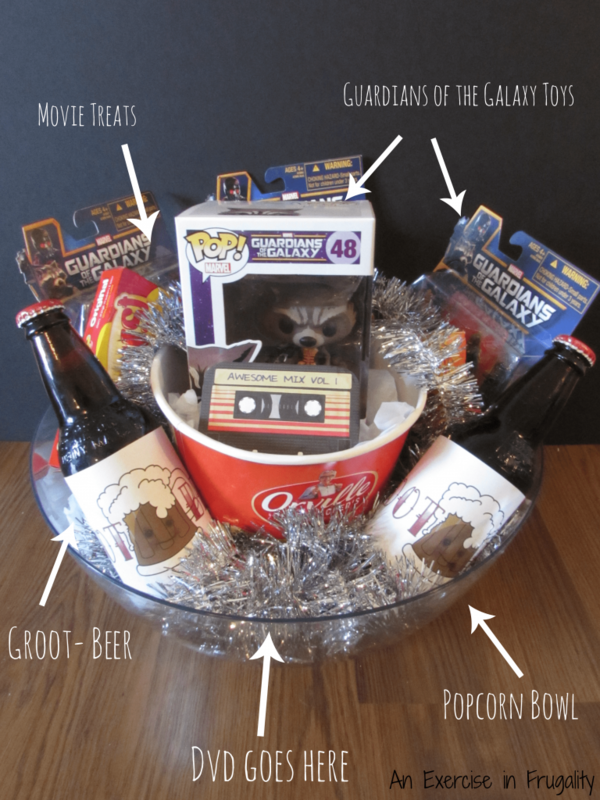 This gift basket creates a movie-night kit that is sure to please Centaurians, Kree and humans alike, and you won’t need anyone’s leg. Before Guardians of the Galaxy came out, my husband was begging me to go see it with him. I loathe science-fiction, space fight movies (and of course, those are his favorite). Originally I resisted, but upon realizing he really wanted to go, I finally relented. I figured I would just drown myself in popcorn and be bored for a couple hours. Much to my surprise, the movie was actually funny. Not just funny, but downright hilarious. I actually really enjoyed it. So much so, that I am planning on getting the DVD when its released on December 9th! It’s a fun movie that is appropriate for older kids (its rated PG-13) but still has a few jokes in there for the adults too. I really enjoyed Groot (played by Vin Diesel) and Rocket Racoon (played by Bradley Cooper). Even though Groot only has one line repeated throughout the movie, he still manages to be my favorite character…and Baby Groot is just too cute for words! I wanted to make a Guardians of the Galaxy gift basket for my husband as part of his Christmas gift since he loved the movie so much. I thought I would share with you how you can make one too. Its simple and inexpensive, yet is still fun! I love making movie-night gift baskets for birthdays and holidays. You just grab a few treats, some popcorn and sodas, a few movie-themed toys or knick-knacks, and a DVD or Blu-Ray and stick them all in a giant popcorn bowl and you have yourself a cute themed gift! 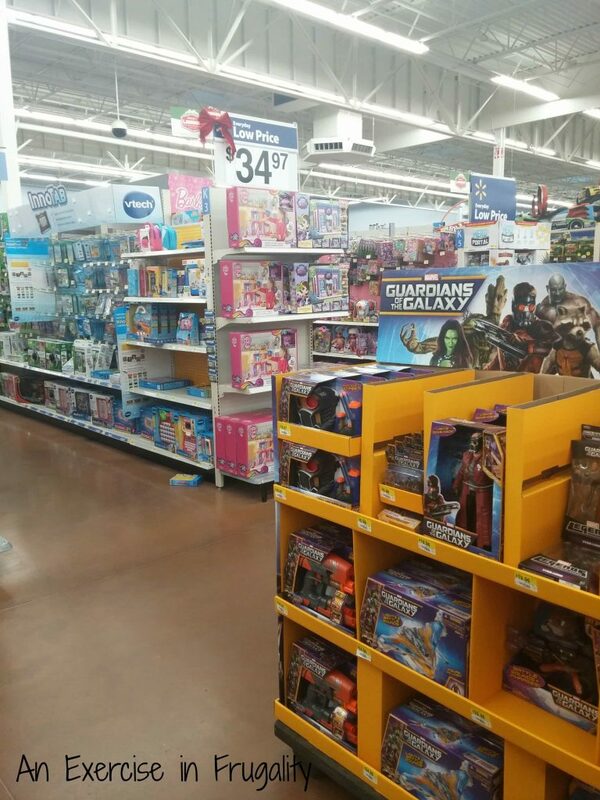 To make the gift basket, I ran to Walmart to find a few figurines and other Guardians of the Galaxy toys. I imagine these will wind up decorating my husband’s office at work. It turned out really cute! AND I am sharing the printable here with you for free if you’re interested in making your own (for your own personal use of course, not to be sold!) Just click on the image below to download the printable file. 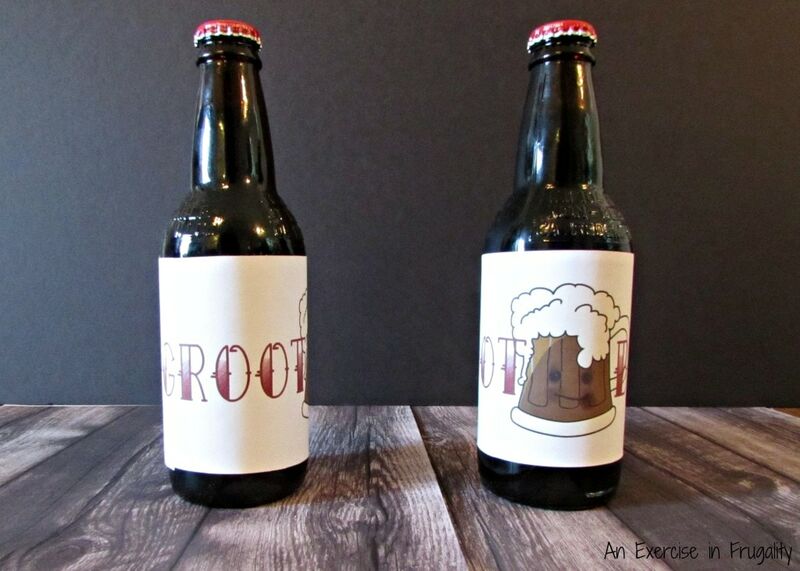 You can then cut them out at the crop marks, and tape or glue them onto root beer bottles to make your very own Groot Beer! Then of course, there’s the famous cassette tape, Star-Lord’s Awesome Mix Vol. 1. 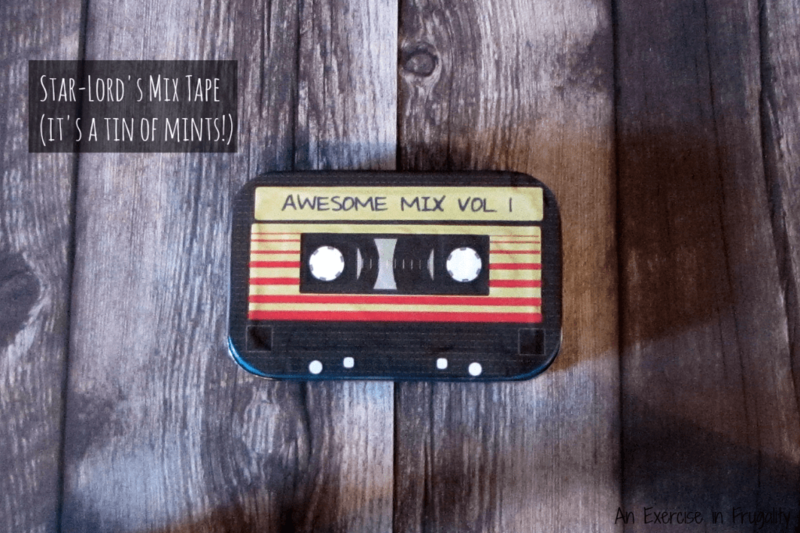 I wanted to include this iconic part of the movie, so I designed another printable to turn a simple tin of mints into a “cassette tape”. I am sharing this printable with you below as well! Simply click the picture below and you will download the printable file. It’s already sized for a standard tin of Altoids (slight trimming may be required) but then just glue it on and you’re good to go! As you can see, I left room in the front for the DVD. It will be released on December 9th, so as soon as it’s available, I’m gonna grab it before it sells out (you can pre-order as well). 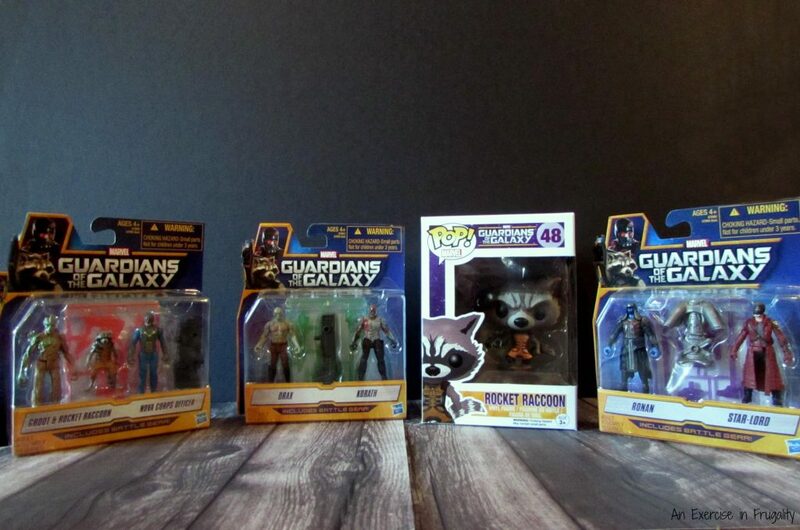 Also, if you purchase the Guardians of the Galaxy Groot, Rocket Racoon or Drax figures for Disney Infinity 2.0, you will get a $5 Walmart Gift Card with your purchase. AND when the DVD is released on December 9th, look for exclusive character O-sleeves, music zinepack and a 64-page magazine with cast and crew interviews, behind-the-scenes photos and trivia. There’s also a custom “Awesome Mix Vol. 1” Cassette laptop decal. Speaking of the Awesome Mix, you could also put the cd or cassette of the soundtrack in the basket too! There’s lots of ways to customize this gift to suit the recipient. To finish off this gift, I’m going to wrap it in a cellophane gift basket bag topped with a bow. Just as soon as I get my paws on a copy of the DVD. I think my husband will love it and I think your kids and teens will too! What do you think of my Guardians of the Galaxy Gift Basket? Cute! The Groot-beer has me giggling. So fun. I might need to print those for a movie watching party.